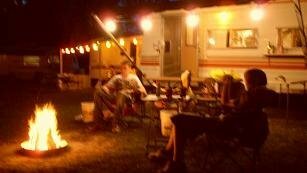 Last minute camping update: Any vacancies for Upstate NY campers this holiday weekend? 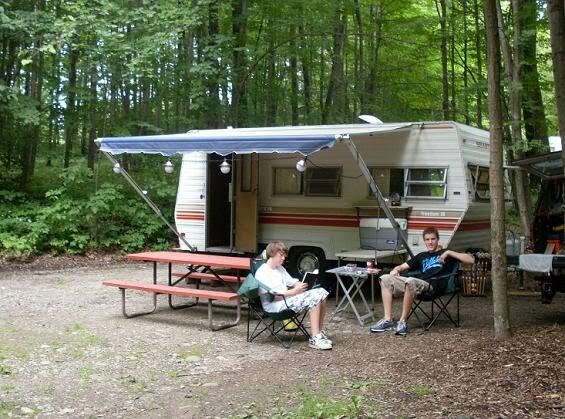 Our favorite campgrounds are all full! We've had a spectacular week of Perfect Camping Days and Nights, all leading to what promises to be a rare fine-weather three-day weekend. Usually it's tough to plan much of anything for Memorial Day Weekend here in western NY. This year we knew in advance that all three days would be nearly idyllic. Pricing: $98/day with 3-days required. Upcoming events: new Pig Roast for July 9 - 11. 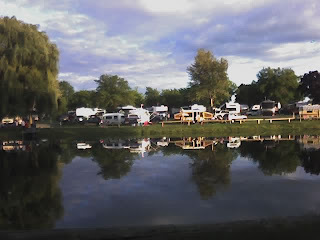 Canandaigua/Rochester KOA: Ruth and Victor note: "we're completely full"
Upcoming events: full slate of activities for 4th of July holiday weekend. New features: a canine recreation area with obstacles and more. Cheerful Valley Campground: Peg offers: "We have a few no-hookups sites available"
Pricing: $105 for all 3 days (required). New features: some campsites upgraded from last year. Of note: don't miss the waterfalls and hiking trails. 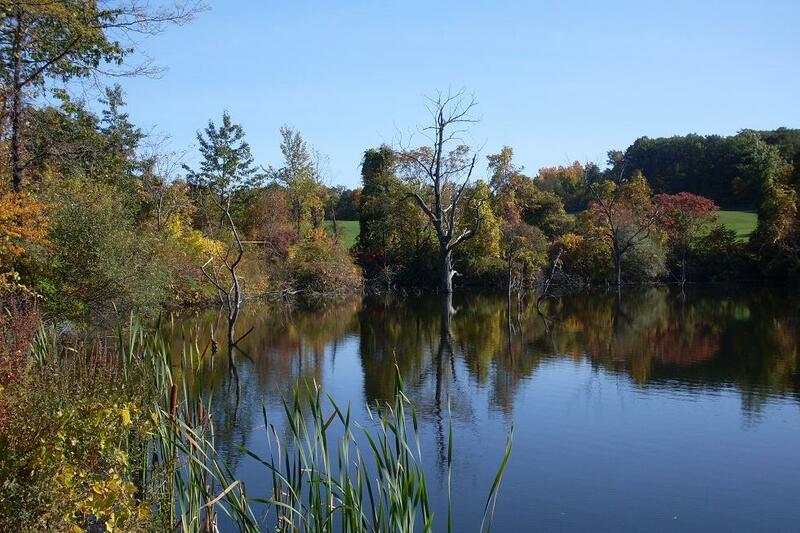 New features: several new campsites on the creek, with beaches! New features: answering machine mentions "new water zone"
Bedford Creek Marina and Campground: Tammie says, rushed, "we're completely full." New features/activities: "please check our website"
We've stayed at every one of these campgrounds at one time or another over the past six years. Some, we've enjoyed several times. All come recommended. The Ratings are relative; every park is at least "good." With the current uncertainty surrounding NY's State Parks, you might find yourself visiting a privately-run camping resort for the first time. We were apprehensive at first, years ago, because we had grown used to staying at Hamlin Beach State Park. Private campgrounds are as different as people are. Call ahead, ask questions, and tour the websites before you make a reservation. If you have a campground you'd like to see added to this list, please contact me via Comments or by using the link at the top of this page. How do you relax? "We like camping better!" There comes a point when you know that Camping Season has arrived at last. Today, a week before Memorial Day Weekend, that moment happened. We've had three consecutive Perfect Camping Nights (no rain, no wind, low sixty or better). What's more, those balmy nights all happened leading into a weekend. This would indeed have been a Perfect Camping Weekend -- a rarity in Upstate New York. We're not camping this weekend. We rarely get out before the first holiday of summer; and we hardly expect the weather to cooperate anyway. Still, the smell of maple logs burning lingers in the morning air. The sound of last night's peepers has transformed to the chirp of the summer birds in the trees around my balcony deck. I spent the first minutes of the morning in a sun-dappled shade with a cup of coffee and a good book. [Rex wrote] I think I know what Jim's answer will be to this one, but it shouldn't really be hard for anyone. To totally unwind and relax, what is your special escape? Everyone has a special one, reading, gardening, traveling, or whatever. For me, it is camping. I go to a primitive site (no out houses, showers, or other amenities) and park my rear end for a few days. I walk around, I talk to the animals, I explore, I sit in front of the campfire and stare into the flames, and all without the TV, DVD, VCR, Computer, or any other electronic gadget. The closest I get to electronic is the car, which is mostly used to get us there and home. I don't even carry a watch. I can usually tell by within a half hour, what time it is by looking at the sun. I have a lot of hobbies, but my escape is camping. I calm down and everything starts to make sense again. Unfortunately, in 2007 I went camping 13 times, and since moving here, I've gone camping 3 times in three years (counting the upcoming trip). We had some interesting replies from the gang at Helium. Angie mentioned horseback riding and boating. Kat talked about reading, rosary beads, and the beach. Rachel loses herself in editorial work, mentoring, and playing the guitar.The whole group agreed that "the beach" should figure in the answer, somewhere. "Of course, you know how much I love camping. I've also written, here at Helium, about a perfect Sunday morning at home -- the solitude of dawn, when the rest of the household is still asleep. While those Sunday mornings can be productive times, they are often best spent deep in the pages of a good book, too. "Camping allows me to put all the pieces together: a quiet weekend morning, my family sleeping peacefully, a battery-powered radio playing a bit of country music at background volume, a hot cup of coffee, and time to read a few dozen pages uninterrupted. If I reach a point where the book might be set aside, that's also the perfect time to write. A couple of my favorite articles were penned in just that way. "The only part I haven't been able to bring to the mix is a beach. The sound of waves and gulls is one of the most soothing noises a person can enjoy. I'll have to work on finding a campground with something bigger than a fishing pond. "The best part of these morning camping moments of solitude is that they always end pleasantly. The kids wake up and want to go for a hike, or toss the Frisbee. My wife hustles up some "cheesy eggs" and toast. The sun bursts over the treeline, and the rest of the campground comes to life. The day will pass quickly, and we'll be tired by evening. Our eyelids will get very heavy by the flickering light of our campfire. And soon enough, we'll pack up and head back to our hectic reality." Jim, I knew what your response would be, because we are so much alike. Most everyone knows I get up around 4 am every morning. Fewer know that it is mostly from camping. That is usually an hour or so before it starts getting light. That gives me time to build a nice hot fire, make some coffee, and get comfy so that when the life starts returning to the forest and steam is rising up from the water, I'm parked in a chair, witnessing it all. The sun is usually shining brightly before everyone else gets up, so it is my special magical time, just for me, and the nature around me. More than once, the wife has gotten up when the first rays of the sun were licking at the tent, to find me sitting happily, sipping my cup of coffee, and with a stringer already full of fish. She thinks I'm half crazy. I've been working for years to convince her that I'm not half way. Crazy? Not a bit. As my good friend Raymond always notes: "We like camping better!" How do you relax? A chair and a book by the beach? An IPod and a long drive? A horseback ride through a mountain meadow? What works for you?